South Puget Sound Community College and the SPSCC Foundation announced its acquisition of the Louis Walker Middleton building from the Estate of Olympia philanthropist Dr. Angela Bowen. The announcement event held on Jan. 16, 2019, celebrated Dr. Bowen’s $1.19 million in-kind contribution to the SPSCC Foundation, the largest gift in school history. 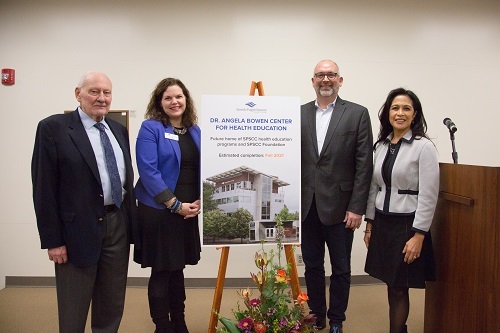 SPSCC has designated the 24,000-square-foot building as the Dr. Angela Bowen Center for Health Education. The building will serve as the instructional home for some of SPSCC’s health education programs and become the primary office of the SPSCC Foundation. Students will begin instruction in the building when classroom and lab space are completed. Estimated completion is fall 2021, allowing SPSCC to expand programs for high-demand fields, like nursing and medical assisting. The event included a celebration of Dr. Bowen’s legacy and a message of community impact on health care from SPSCC president Dr. Tim Stokes, SPSCC Board of Trustees Vice Chair Leonor Fuller, and Executor of the Estate of Angela J. Bowen and SPSCC Foundation Board Member Ted Schultz. About 70 guests attended, including representatives from Capital Medical Center, Kaiser Permanente Olympia Medical Center, Providence St. Peter Hospital, the Estate of Dr. Angela Bowen, and the Angela J. Bowen Conservancy Foundation. Dr. Bowen was a physician, medical research pioneer, and dedicated community philanthropist. One of just four women in her medical school class, she spent much of her life working to improve access to medical services, especially for women, and supporting medical ethics research and patient’s rights. She also had a long history of philanthropy and natural resource conservation and invested millions of dollars locally to conserve and protect treasured Olympia resources. This building was named in honor of her stepfather, Louis Walker Middleton. Health care is the second largest industry in Thurston County, and the fastest growing from 2014 to 2016. Careers in health care are forecasted to increase significantly over the next 20 years and SPSCC is making big moves to educate for and fill those jobs. SPSCC’s growing programs will move into a new spaces, expand enrollment cohorts, and send confident and educated graduates into the county’s many clinics and hospitals. For more information on health education at SPSCC, visit the Heathcare Pathway page.